NOT QUITE SURE OF THE SIZE BUT THE BED IN THE PICTURE IS A KING SIZE BED. Condition: OK USED CONDITION. THERE IS A FEW SMALL HOLES HERE AND THERE AND A GOOD AMOUNT OF SMALL STAINS WITH A FEW BEING ON THE BIG SIDE. USE IT AS A BATH OR BEACH TOWEL, OR. We will reply you within 24 hours. HANG IT UP AS DECORATION! 1 Madeira Embroidered and Cutwork Linen Hand Towel 26 1/2" by 17"
Up for auction is a Madeira white linen hand towel with a vase and bow design. Very nice. It measures 26 1/2 by 17 inches and is in good used condition. Great condition no holes, stains or spots no issues. VIEW ALL 15 PHOTOS IN BODY OF DESCRIPTION Pretty vintage Thick Fluffy Chenille cotton bedspread that is a heavy stock cotton with Pink chenille diamond's on the center of the platform with white chenille diamonds on each side with a Blue & aqua chenille border around the platform & pink chenille stripes with white chenille swags on the sides. It measures approx 103" by 77" with the platform 42" wide 83" long. There are no holes a couple of missing pieces of chenille on the left side top pic 7 & 8 front & back with a couple on the edge pic 9. A small spot pic 11 with a water mark stain lower right pic 13 & 14 & will need to be laundered , weights just under 6 lbs prior to packing. It is Ivory colored with Green, Red, Yellow and Black Stripes. Needs to be cleaned but still in very nice condition for its' age. Very heavy extra warm blanket. Just look that wonderful initials "N". Excellent estate condition. 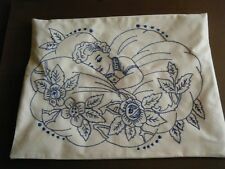 Vintage pillowcase set. 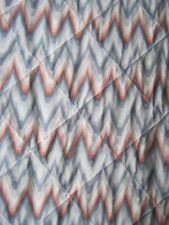 Softer, older cotton measures 16 1/2" by 27 ". Hand embroidered dark pink flowers with teal green foliage around them. Hand crocheted border is in white and it measures approximately 1/2 " wide. The cases are in good condition. 3 Madeira Applique / Shadow Work Embroidered Linen Hand Towels 19" by 13"
Beautiful Butterfly Madeira Embroidered White Linen Hand Towel 19 1/4 x 13"
I am pleased to offer here beautiful hand embroidered pillow case. . They are made of finely woven linen with an appliquéd band of white at the front and an embroidered design. The front is decorated with a charming silhouette of a woman's head with a white hat and collar, flanked by two black bows. GORGEOUS HIGH QUALITY FINE SNOWFLAKE DESIGN CROCHET LACE BEDSPREAD 82" BY 69"
In the pictures it's shown on my California king bed. Very high quality work, look at those raised rosettes. I am thinking this should be easy to repair. Gorgeous white linen with expert light blue embroidered flowers. There are a few small spots and minor holes. See my pictures. Beautiful Appenzell Madeira Embroidered Linen Hand Towel 14" by 9 1/2"
Up for auction is an Appenzel or Madeira linen hand towel in nice fine white linen with embroidery and drawn work. Very nice. They measure 14 by 9 1/2 inches and is in good used condition. Enjoy. 1 Beautiful Madeira Embroidered Linen Hand Towel 14" by 8"
Up for auction is a nice yellow Madeira hankerchief linen hand towel with very beautifully embroiderd design. Very nice. 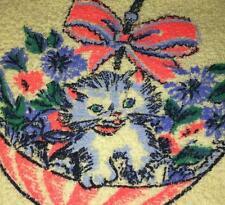 It measures 14 by 8 inches and is in excellent estate condition. See my last picture to see the glue mark left by the tag. Enjoy. THIS ITEM: NICE TO USE FOR CRAFTS. FABRIC: COTTON. SIZE: 98" X 85". CIRCA: 1950s. 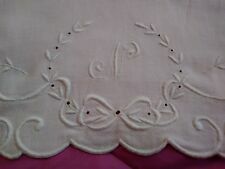 Embroidered Linen Hand Towel 22" by 14"
Excellent estate condition. Note there is fraying to the edge. Beautiful Madeira Embroidered and Applique Linen Hand Towel 18 1/2" by 12 1/2"
Gorgeous Madeira Pink Embroidery on Crisp White Linen Hand Towel 18 x 13"
This piece has no stains: there are a couple of small areas that the blue is coming part or unstitched but underneath is the white so I never even noticed before. This is a two part piece, seam put together down the center. Pretty Set of Heavy Linen Hand Towels Rainbow Pattern Initials (SBR) 21.5 by 15"
Embroidered hand towel set with a georgeous set of initials (SBR) done in muli tone embroidery in a chain link type of pattern on heavy damask?. linen that is rainbow colored (blue, pink, yellow, green, and purple). 2 Madeira Applique Embroidered Light Grey Linen Hand Towels 20"x13 1/2"
Pretty Floral Design Hankerchief Linen Embroidered Hand Towel 18 1/3" by 13 1/2"
Up for auction a Pretty Floral Madeira White Hankerchief Linen Embroidered Hand Towel 18 1/2" by 13 1/2". Ready to use. Beautiful Madeira Embroidered Soft Yellow Linen Hand Towel 20 x 14"
The fine linen is soft yellow with white embroidery. Very nice. 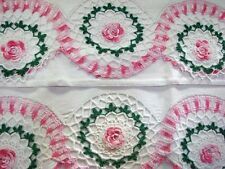 Beautiful Madeira Pink Embroidered Pink Linen Hand Towel 20 x 12 1/2"
Up for auction is a nice Madeira embroidered linen hand towel in crisp white linen. 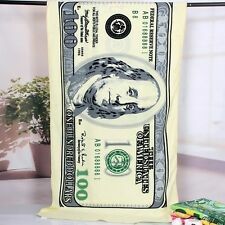 The towel measures 24 by 16 1/2 inches. Excellent estate condition. See my pictures. Enjoy. Type: Blanket. Condition: Fair overall. Noticed staining on both sides of the blanket - mainly near the ends. Free of holes or bad odors. Embroidered Linen Hand Towel 22" by 14 1/2"
A Marghab embroidered guest towel in their Rose Tree pattern. 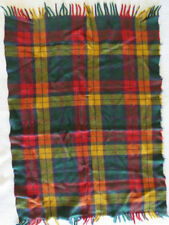 No stains, good color, one very tiny hole in the middle near the center seam - see last photo. Pretty Bow Design Light Gray Hankerchief Linen Embroidered Hand Towel 20" by 14"
Up for auction a Blue Bow Design Madeira Light Gray Hankerchief Linen Embroidered Hand Towel 20" by 14". Ready to use. 9 PURE LINEN HAND MONOGRAMMED ANTIQUE SHEETS HEMSTITCHED - SO SOFT - 70" X 103"
Beautiful old coverlet or bedspread. 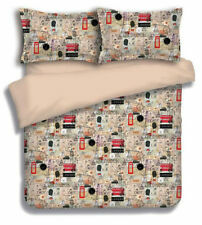 Not a quilt - a coverlet or bedspread in a double layer of fine old linen. THE STEVENS / UTICA DOUBLE FLAT SHEET DOES NOT HAVE THE YSL LABEL . 1976 YSL YVES SAINT LAURENT DOUBLE FITTED SHEET & 2 STANDARD EMBROIDERED PILLOWCASES. Vtg.J.P. STEVENS/ UTICA. DEEP ORANGE COLOR.PILLOWCASES HAVE YELLOW PIPING & YELLOW IRON ON EMBROIDERED YSL. Up for auction is a pretty set of 2 gorgeous embroidered and hemstiched medium weight beige linen hand towels. The towels measures 16 by 11 1/2 inches. Excellent estate condition. See my pictures. Enjoy.